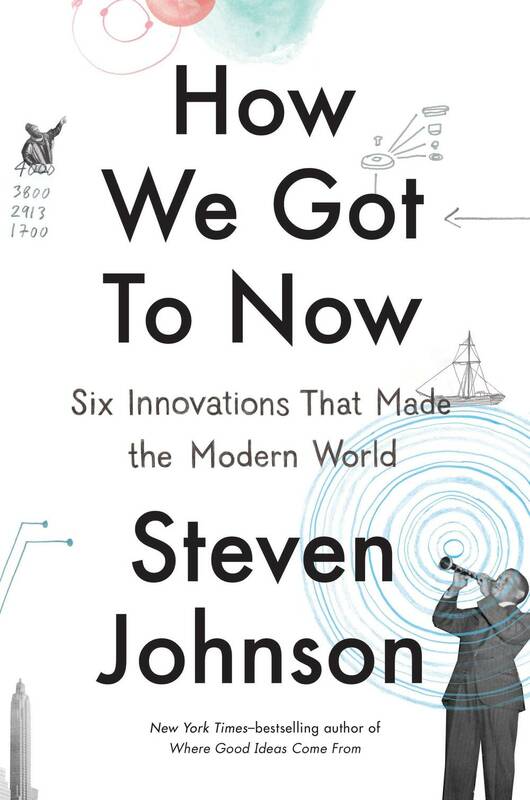 Steven Johnson's How We Got to Now: Six Innovations that Made the Modern World is exactly the sort of macro-focused science idea book that I love. Johnson looks at world history not from the human perspective but from the innovation perspective and how innovation and technology have propelled the world forward through history. He focuses on six big ideas: cold, sound, light, time, glass, and clean. I loved everything about this book, from the history lessons we learn about things like shipping ice halfway across the world to the lovely anecdotes about brilliant (and sometimes forgotten) people who have changed our world to the unexpected impacts that innovations have had on our world today. For example, after Gutenberg invented the printing press and books were made widely available, people realized that they were far-sighted or near-sighted and corrective lenses were born. Another innovation in glass, the mirror, allowed people to see themselves for the first time, and so artists started painting self-portraits (the original selfie) and authors started writing fiction, often about internal struggles and journeys, as a result of so much self-examination. My favorite of the big ideas was the one on glass, but all of them are fascinating. Such a fun and inspiring book that makes you think much more about the world around you and the everyday marvels and miracles we experience without even thinking about them. I really enjoyed Michio Kaku's Physics of the Impossible when I read it last year, so I was excited to get my hands on his new book, The Future of the Mind: The Scientific Quest to Understand, Enhance, and Empower the Mind. It seems impossible, but actually, this new book felt way more out there and abstract to me than Physics of the Impossible. I am not sure why wormholes and invisibility suits feel more tangible to me than formless minds and specific-memory-erasing medication, but it's true! There was a lot in this book that was way over my head, and a lot that stretched the limits of belief. If nothing else, The Future of the Mind makes you understand and value just how complex and amazing the brain is, and just how much is subconscious and therefore very difficult to program into a computer. It's absolutely fascinating. This book also tackles many more of the ethical dilemmas and minefields that are inherent to mind manipulation. For example, if you could erase a painful memory to decrease your pain, would you? Many people say no, but no one considers it unethical to give a person morphine against physical pain. We treat physical and mental pain differently, and perhaps that is unfair to people who suffer greatly from painful memories. Similar ethical issues arise as robot technology becomes more complex. Should robots have feelings? Should they be able to feel pain? At what point does the line between human and robot begin to blur? For lack of a better word, this book is just really COOL. There are so many scenarios and hypotheses raised here that have never even occurred to me. For example, what if space travel were possible not with our bodies but only with our minds? What if humans and robots merged into one type of being at some point in the future? What if we find ways to combat and then eradicate brain disease? Or to pump up the features of the brain to become super-humans? Are these things even possible? And if so, what is the time line for them? So much to think about! Even though some of the information presented was difficult for me to follow (especially in audiobook), I found this book to be so inspiring. So much work is being done to understand how our minds work, and we will know so much more over the next several years and decades. I am excited to read Michio Kaku. The Future of the Mind has been on my list for a while -- I love thinking about what science and the brain are capable of. And -- hmmmm about the painful memories. It would depend! It would depend on if anyone else was involved in the memory, like, I wouldn't want to erase a piece of shared history with someone I cared about, probably, even if it was painful. I am intrigued by the comparison of painful memories and physical pain, and why can one be muffled and not the other. Of course the idea of erasing a specific memory cannot but help recall The Eternal Sunshine of the Spotless Mind. I always think of the plotline of Kirsten Dunst's character, and how she learns that she has been repeating the same mistake over and over - the whole tie between memory and personal evolution and change. There's something scary about touching memory as if we don't completely understand the repercussions it would cause to erase it. And yet, we know the repercussions of kept memories, and how certain painful memories can also prevent personal evolution and change, and moving on. It's a lot to ponder. Yes, actually, Kaku talks a lot about Eternal Sunshine in that part of the book. There's something to be said for learning from certain memories. But memories of being a victim of physical violence or something else - I don't know if those are really teachable moments. At the same time, memories are so interconnected in so many parts of our mind, it's hard to know what the impact would really be.